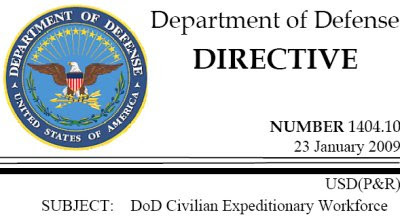 A little-publicized Department of Defense Directive (Number 1404.10) establishes a “DoD Civilian Expeditionary Workforce” and rescinds a prior directive dealing with the emergency use of civilian personnel. The new 1404.10 cancels the prior directive of the same designation (“Emergency-Essential (E-E) DoD U.S. Citizen Civilian Employees”), which was issued in 1992 under President Clinton. The 1992 directive specifically deals with overseas deployments of civilian personnel. It does not mention terms like “restoration of order” or “stability operations”, prominently featured in the new directive. The 1992 directive mentions the term “overseas” no fewer than 33 times. The 2009 directive does not mention the term “overseas” in the body of the directive even once. Who will define “Contingencies”? “Restoration of order”? “Stability operations”?